Photos to follow PINA COLADA . Please Note: is a collectors bear and not suitable for children. Pina Colada is a hand made 5 jointed traditional Bear. foot and paw pads, black glass eyes and a red hand embroidered perle cotton nose. Kirsten One only. Measuring 17" (43cm) tall. Priced at £149. Please Note Kirsten is a collectors bear and not suitable for children. with matching pink ultrasuede foot and paw pads, black glass eyes, with pink coloured perle cotton hand embroidered nose. Please Note: Mallory is a collectors bear and not suitable for children. Mallory is a hand made 5 jointed traditional Bear. foot and paw pads, black glass eyes and amatchingh and embroidered perle cotton nose. Please Note: Dominique is a collectors bear and not suitable for children. Dominique is a hand made 5 jointed traditional Bear. foot and paw pads, black glass eyes and a matching hand embroidered perle cotton nose. Please Note: Calder is a collectors bear and not suitable for children. Calder is a hand made 5 jointed traditional Bear. Please Note: Rosa is a collectors bear and not suitable for children. Rosa is a hand made 5 jointed traditional Bear. foot and paw pads, black glass eyes and a pink hand embroidered perle cotton nose. Please Note: Briar Rose is a collectors bear and not suitable for children. Briar Rose is a hand made 5 jointed traditional Bear. Please Note: Kaden is a collectors bear and not suitable for children. Kaden is a hand made 5 jointed traditional Bear. 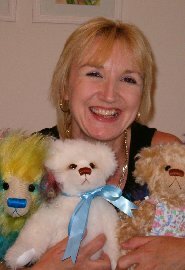 Please Note: Jenni is a collectors bear and not suitable for children. Jenni is a hand made 5 jointed traditional Bear. Made for the Hugglets Winter Bearfeast. Please Note: Digby is a collectors bear and not suitable for children. Digby is a hand made 5 jointed traditional Bear. Please Note: Willow is a collectors bear and not suitable for children. Willow is a hand made 5 jointed traditional Bear. Have a bear made with a personalised name on his foot pad.